To uphold and defend the Constitution of the United States of America; to maintain law and order; to foster and perpetuate a true spirit of Americanism; to preserve the memories of our former members and the associations of our members and our forefathers in the Great Wars; to inculcate a sense of individual obligation to the community, state and nation; to combat the autocracy of both the classes and masses; to make right the master of might; to promote peace and good will on earth; to safeguard and transmit to posterity the principles of justice, freedom and democracy; to consecrate and sanctify our friendship by our devotion to mutual helpfulness; to adopt in letter and spirit all of the great principles for which The American Legion stands; and to assist in carrying on for God and Country. 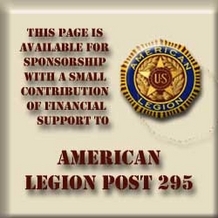 Sons of The American Legion Squadron 295 was founded in 2003, exists to honor the service and sacrifice of Legionnaires. SAL members include males of all ages whose parents or grandparents served in the U.S. military and were eligible for American Legion membership. Members of the Sons of the American Legion come in all ages. The glue that keeps everyone together is that they are all male descendants of an American Legion member or a deceased veteran who was eligible to be a member. The Jackonis family is an example, Michael Jackonis served is the US Navy and is a member of Lithuanian Post 174. His father served in the US Navy Reserve and has served on active duty during the beginning of the Vietnam Era, making Michael eligible for the SAL. Like many, Michael Jackonis is a "Dual Member." By virtue of his service and status as a Legionnaire, his son, Logan became a member based on his father's service. Do you have family members who are eligible to become members of the SAL or Auxiliary? There are many benefits available to members that are expanded every day. Male descendants of Legion members or of a deceased Veterans who was eligible to join the American Legion may join the SAL. Your Veteran must have served during the time periods above.